The recent suicides of handbag designer Kate Spade and Anthony Bourdain with a weekly televised show on his world travels - two famous, very wealthy leaders - put a spotlight on suicide which kills 45,000 Americans a year. That's twice the 17,250 who are murdered annually in the U.S. In fact, there were 1.3 million unsuccessful suicide attempts last year, 650,000 of whom required medical attention in emergency rooms! 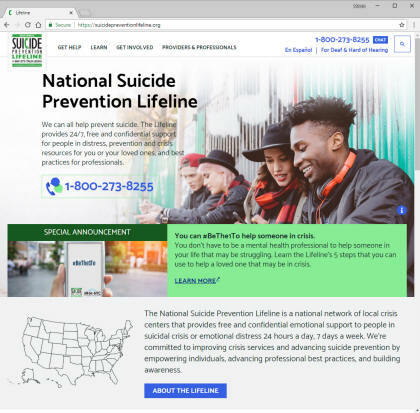 The suicides of Spade and Bourdain have sparked at least a 25% increase in the number of calls to the National Suicide Prevention Lifeline (800-273-8255). Frankly, I think the increase is vastly higher. I called this phone number and had to wait through 10 minutes of repeated, pre-recorded announcements before a live person got on the line. The only good news is that the calls are coming not just from the suicidal, but from friends who are worried about people considering suicide. From 2005-2009 there was a 55% increase in emergency room visits by men aged 21 to 34 for drug related suicide attempts, and a 49% increase by women over age 50. "The incompatibility of physician-assisted suicide with ethical medical practice is illustrated by the stunning news published in April that in Washington D.C. nearly a year after enactment of an assisted suicide law, only two out of 11,000 licensed physicians (0.02%) had registered to participate..." Physicians do not want this power. If physician-assisted suicide is legalized, many relatives of depressed or elderly relatives will think it is all right to give them death-inducing drugs. What can be done to reduce suicides in America? I have six suggestions. First, pastors should preach on the need to provide pastoral care to those struggling with mental illness, particularly anyone who has considered suicide. Clergy should create committees in each church of physicians, mental health experts, educators and loving church members who can communicate God's love for all who are in need, and to their families. Second, clergy, teachers and pastoral leaders need to know warning signs that someone is at risk for suicide. A person who talks about wanting to die, or who expresses a feeling of hopelessness or of being trapped or who is in unbearable pain - may be considering killing themselves. Other danger signs: talking about being a burden to others, or someone who has increased their use of drugs or alcohol, or is acting anxious or agitated. They may behave recklessly, withdrawing or feeling isolated. Some show rage, talk about taking revenge or display extreme mood swings. Third, experts and concerned lay people need to establish a relationship with hospital emergency rooms, and provide care to those who may have attempted suicide. In Taiwan, emergency room follow-up after suicide attempts led to a 63% reduction in suicides! Fourth, provide training to community, religious and clinical service providers on the prevention of suicide and related behaviors. That training should include how to recognize the warning signs for suicide and actions to take in response. Fifth, remove guns from homes of those at risk, and other means of killing one's self such as excessive numbers of sleeping pills or other harmful drugs. Sixth, I urge passage of laws, like those passed in Florida after Nikolas Cruz killed 17 people at a high school in Parkland, Florida February 14, 2018. Afterwards, students campaigned for gun control laws. The Florida Legislature raised the age for buying rifles from 18 to 21. It established waiting periods and background checks for gun buyers. Bump stocks were banned and potentially violent or mentally unstable people were prohibited from possessing guns. Every state should pass similar laws. Congress should also enact similar laws since many states will not follow Florida's example. The Justice Department should also investigate and prosecute guns store owners who sell weapons to felons and other dangerous people or to the many who sell guns without an appropriate waiting period. Finally, suicide prevention must be led by people who have experienced the agony of the suicide of a friend, relative or colleague. For example, those who have answered 800,000 calls on the Suicide Prevention Lifeline (800-273-TALK) - should help double the 161 local crisis centers, and provide a Preventing Suicide Toolkit to every high school. We can drastically reduce the number of people who kill themselves.